I'm sitting beside you, and you're playing Plants v. Zombies on my iPhone while I watch the morning news and skim my favorite websites. The news has just reported that Malala Yousafzai did not win the Nobel Peace prize. She's the teenager from Pakistan I told you about once. When I first read about her story, I explained to you that in parts of the world, little girls aren't allowed to go to school. I remember how hard it was for you to understand this and how you shared my sorrow about this cultural attack on girls and young women. Then, thinking quietly of the girls who are denied so much more even than education- girls who are treated as property, who come of age to experience condoned sexual assault and violent mutilation, I began to sob. You comforted me, as I wept for those girls, the incredible strength of Malala, and the grace of the universe as she recovered from her attempted assassination. This morning you're snuggled against me in bed, home sick from school. (And if you don't feel better soon, we have health insurance and easy access to your wonderful pediatrician.) The privileges you and I enjoy are flooding me and I feel overwhelmed with mixed but powerful emotions. I feel so grateful for the embarrassment of riches you take for granted, and though I admit to feeling guilty enjoying such gifts myself, I want you to be innocent in your enjoyment of this life. Your biggest worry is missing your spelling test today. That's such a stark contrast imagining the girls and women dying- dying- for the hope of education. I shared with her a smaller perspective: My mother wasn't allowed to wear pants to school in her 1950s West Virginia classroom. Though we laugh through Adventure Time and play games with your homework, you surprise me so often with your awareness of our larger world. You're an amazingly empathetic little one, my girl, and you hear bits of stories from the news or from school lessons and you run to me, wide-eyed with concern about hungry children or frightening wars, looking to me for understanding. And I fail so completely to understand these things myself, that all I can do is share the confusion and outrage with you. I can only tell you that the world can be a hard place, as I hold you tight against my heart and promise you that we are safe here. I explain how secure our little family is, nestled into a hillside in a tiny enclave of America. That your schoolbus, colored that joyful yellow, takes you and your best girlfriend everyday to your classroom. You bounce and dance off that bus in the afternoons. You adore school and work so carefully. It seems to me you have infinite potential, and I'm so thankful you were born into a place and time that affords you such opportunity to develop it. It's hard to write this thanks. I'm afraid to acknowledge the privilege and be seen as an arrogant white American. Of course I don't deserve it; privilege is just an accident of birth. But looking at the context of Malala's struggles I am absolutely, sincerely grateful that my daughter has this life of blessings. I'm so disappointed that she wasn't awarded the Nobel Peace Prize. It's unnerving that a seemingly political choice was made. 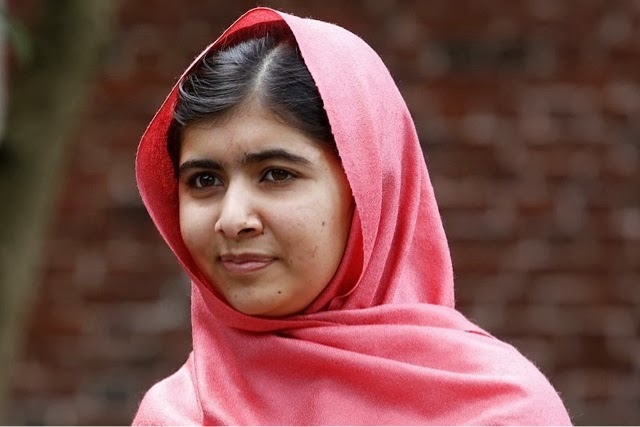 But the world is talking about Malala today, and we are honoring her in our hearts and souls. She's an amazing girl, and her work is changing minds globally. She is a treasure, like you are Molly, and like every child. I want you and all the girls of the world to know you are loved. You are strong, you are beautiful, and you are an incredible force of change. You are so dear, so very beloved, my girl. The world is yours, baby. Yours to work for, to fight so that every girl has the education and peace that you claim as your own. Image of Yousafzai from Wikimedia Commons.